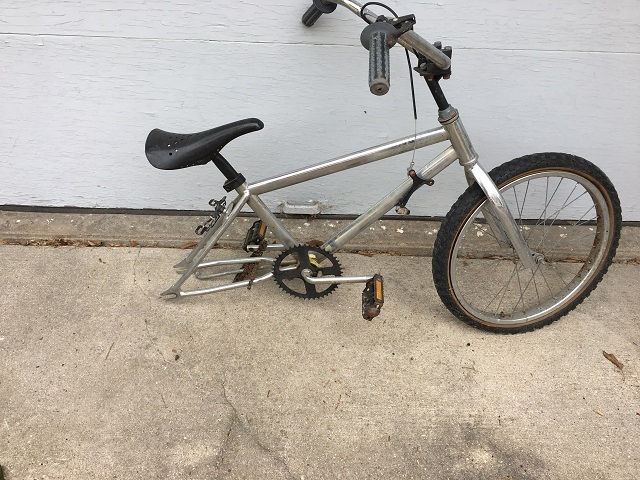 I need help identifying a BMX bike frame. Some background information: I bought the bike for my son about 20 years ago at an auction. At one time I was told that it was "valuable". The only markings I can find on it are "HC1581944" and it is steel. Would appreciate any assistance in determining the brand of this frame. I see no bike - I see some scrap metal that used to be a bike, and could be a bike again if you add the missing parts. Clearly visible is a 1 piece ashtabula crank which is not a high quality design. Also there is no reinforcement gusset between the top and down tubes so its not built for impacts or stunting. Whoever told you it was valuable was probably selling it. Might become more valuable as petrol costs rise. If the chrome is in good condition and there is no rust, then you can have a ridable and usable bike for a back-wheel, tyre, tube, freewheel+cog, chain, brake pads, and possibly some brake cable. I'm not quite sure what the thing on the downtube is - originally thought it was a cantilever from the front but it might be part of the rear brake mech. If your location in the world requires two independent brakes you will need to fit a front brake as well to be legal, as well as any reflectors or bell or whatever is mandated by law. Maybe a Huffy Pro Lightning? where did you find the serial number? the following link has some good detail shots you could compare to your bike and see if it matches. Its serial also started with HC but look for yourself. the fact it has a kickstand on it and some other low quality parts makes it look like its not a quality bike. Any idea what this bike is?